First watch the Monochrome Pro theme setup video. This gives you a good idea of how the automatic setup works. Monochrome Pro theme now uses an automatic homepage setup system. You can choose not to setup the homepage automatically if you wish. You’ll need WordPress 5 and the block editor (Gutenberg) enabled if you want to use this new auto install feature. When you activate Monochrome Pro, you are given the choice to auto install the homepage and some content. If you do use the auto install the homepage is automatically set up for you. Do not click the width buttons! Container blocks are temperamental. If you change the width settings, you might not be able to change them back to their original settings. So I recommend that you do not click the width buttons of columns blocks inside containers. How does this new layout system work in Monochrome Pro theme? 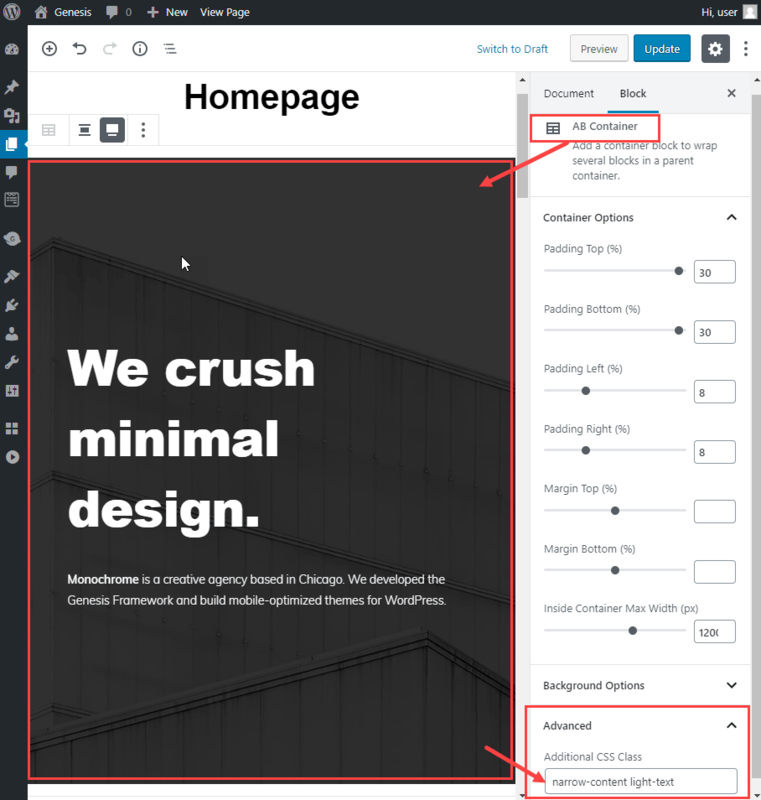 In the past, to setup the homepage of a StudioPress theme you placed widgets into widget areas. With Monochrome Pro theme you place (nest) blocks inside container blocks. The container block is one of the blocks available after you install Atomic Blocks plugin. Atomic Blocks is automatically installed when you use the auto install feature in Monochrome Pro theme. If you’ve ever used a theme that had page sections, you’ll understand the idea behind the container block. A container block can be used to isolate each row of the web page. Container blocks can have white, coloured or photo backgrounds. You place other blocks, such as heading and paragraph blocks, inside a container block. Monochrome Pro has a stripy homepage built from container blocks. The container blocks alternate between image or photo backgrounds and plain white backgrounds. Image background, plain white background, image background, plain white background. If you build your own homepage using container blocks, make sure you set an inside container max width. If you do not set a max width, the text in your container block will but right up to the edge of the viewer’s laptop screen. 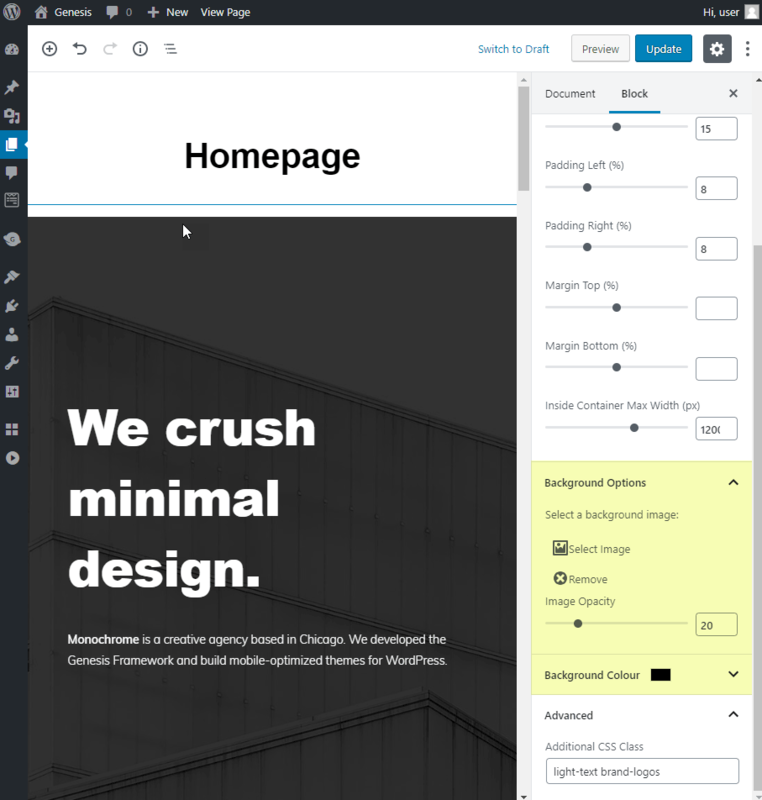 The StudioPress demo site uses an inside container max width of 1200 pixels. If you use the auto install, all of the settings have been done for you. If you choose to build the homepage yourself, here are some useful tips. You do not have to use container blocks. 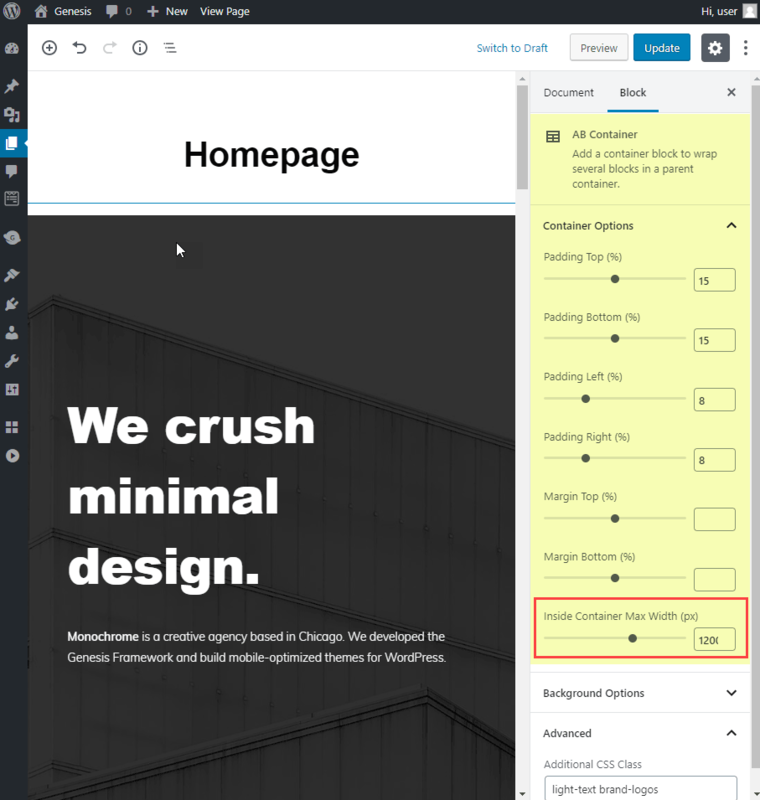 If you’re new to WordPress 5 and blocks, you can build a nice looking homepage from less complicated and easier to use blocks instead. If you’re building the homepage from scratch, not using the auto install method, you will need to already understand how blocks work. If you haven’t used the block editor before, see these basic tutorials. 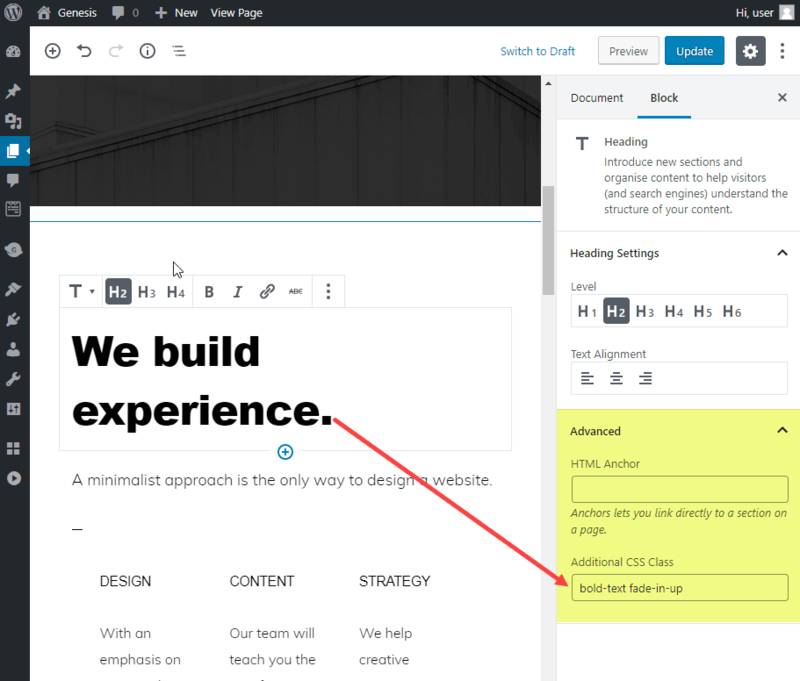 bold-heading-text is applied to the h1 main page heading title. It makes the headline at the top of the page bold and 60 pixels high. bold-text is applied to h2 headings. It makes the text bold and 48 pixels. fade-in-up makes the fade up effect. Load the homepage of the demo site and watch the text slowly fade in. The fade-in-up CSS class makes this happen. brand-logos this class is applied to the logo section. I’m not sure what it does. I think it might resize the logos for retina displays. light-text this makes headings in the dark containers light coloured. If you’re using the Monochrome Pro theme auto install these settings are already set for you. I added them here to help people who want to understand how the page is built. The container block has background options. Using the container block, you can set a background image, colour and opacity. Every block has an Advanced > Additional CSS Class option. The narrow-content CSS class makes the main page headline wrap into a small space. The light-text CSS class makes the headline light coloured, use this class with text displayed over a dark background image. Setting the maximum width of content inside a container block. Any content placed inside a container block will but up against the edge of the browser window. To avoid this you set an inside container max width. We used 1200px here. There are two Additional CSS classes applied to this heading. bold-text makes the headline extra bold. fade-in-up makes the headline fade in as the page loads. Do not touch the width button unless you know what you are doing. 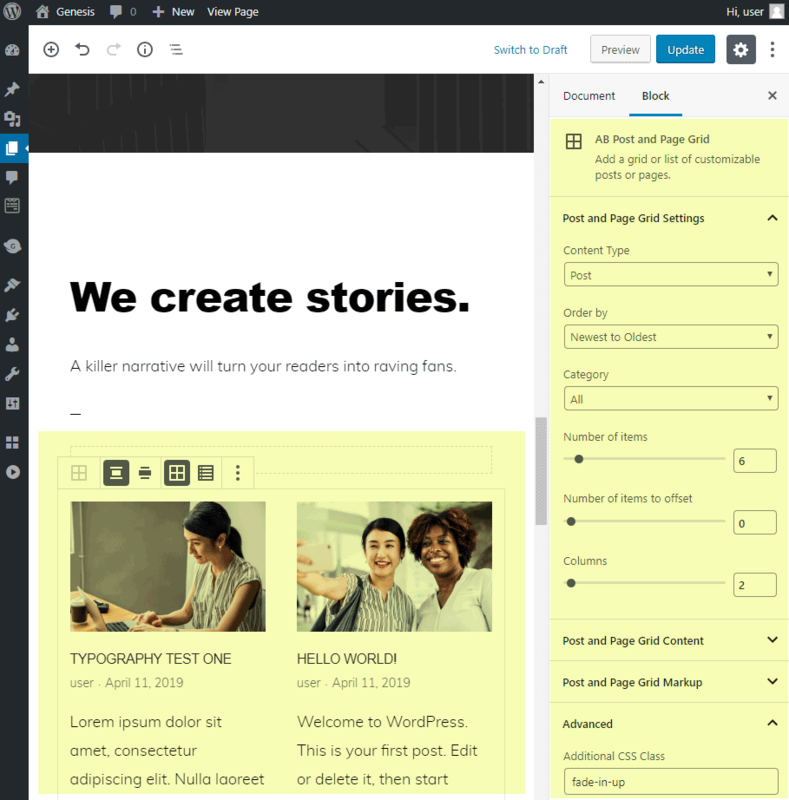 WordPress 5 and the block editor (Gutenberg) are still new. Some things still behave unpredictably. If I change the width setting of a columns block inside a container block, I can’t change back to the original setting. I think this is a bug that will eventually be fixed. But for the time being, I don’t click the width buttons of a columns block that is nested inside a container block. 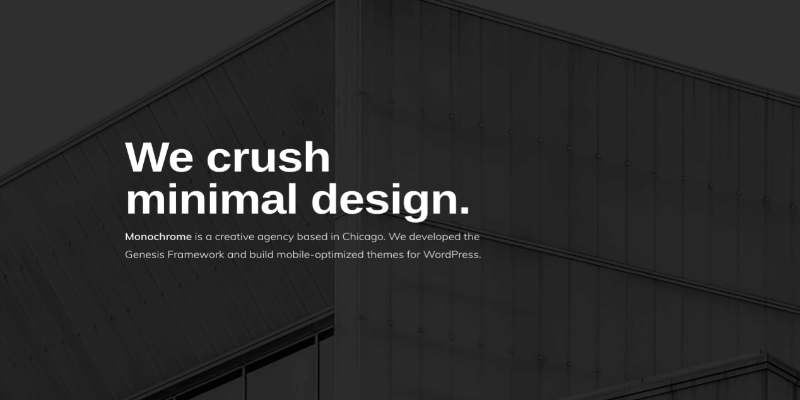 The Monochrome Pro theme demo page uses an AB Post and Page Grid block to display blog posts on the homepage. Click each down arrow to browse through all of the settings. You can show or hide the post title, excerpt, post author, post date and the read more link. There are many more settings. Make sure you read through them all and experiment to see what they do.